BEFORE THE DISASTER. 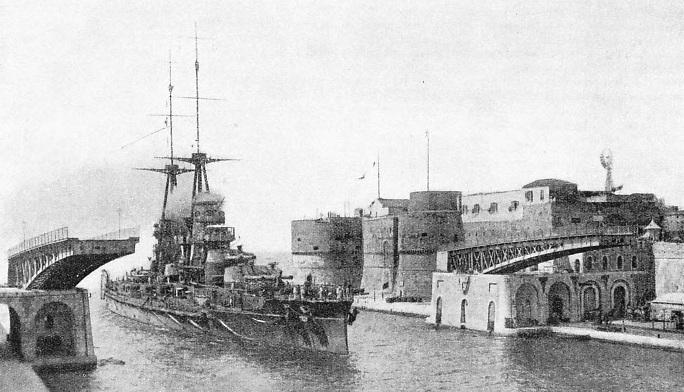 A photograph of the 24,000-tons Italian battleship Leonardo da Vinci leaving Taranto Harbour in July, 1916. Shortly after, on the night of August 2, she was sunk in the bay by an explosion. Two hundred and fifty lives were lost and the vessel, which had cost £2,000,000 to build, settled down into 36 feet of water. 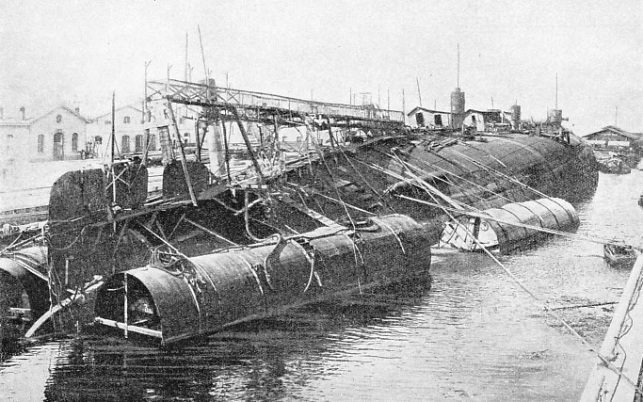 The loss to the Italian Government was so heavy that suggestions for her salvage were put forward by General Ferrati, a naval architect, despite the apparent impossibility of the task. WITH good reason, seamen used to describe a ship which had sunk as “lost”, for, until the end of the last century and the dawn of this, a sunken ship of any size was doomed to remain at the bottom of the sea. Several of the last generation of marine salvage experts began to experiment with divers and patches and with the building of coffer-dams. By the use of powerful pumps they managed to raise an occasional ship from shallow water, but one lying in any depth was considered to be beyond their reach. On the surface a ship possesses buoyancy, which enables her to float. Although a ponderous mass weighing anything up to 70,000 tons or more, and composed of acres of steel plates and millions of rivets, any component part of which would plunge straight to the bottom, this mountain of metal, when properly shaped and balanced, floats on the water. We think nothing of it to-day because we are used to steel ships; but in the middle of the last century the first, man who said he was going to build an iron ship aroused a storm of derision. If any ship loses its reserve of buoyancy it sinks. The salvage expert who sees a chance to raise it again is solely concerned with the question of restoring its buoyancy. 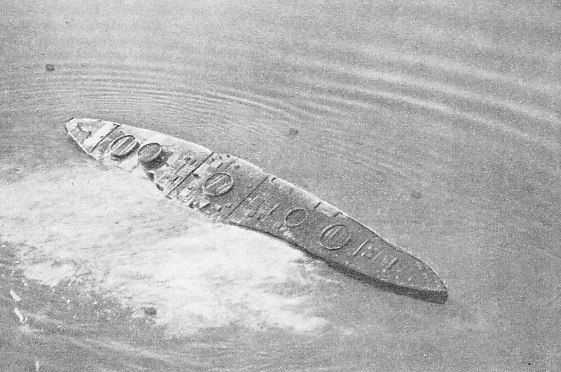 This was one of the problems that the Italian experts faced when the battleship Leonardo da Vinci sank in the Bay of Taranto on the night of August 2, 1916. The ship was riding at anchor when at about midnight an explosion occurred which caused the death of 250 men. It was impossible to quell the fire which followed, and the ship soon heaved over and settled in 36 feet of water. The personnel of the other ships moored at Taranto imagined that a surprise enemy attack had taken place. While the boats from the other ships were picking up the survivors, searchlights swept over the waters and across the skies to find the assailants. The loss of the battleship was for long attributed to a bomb with a time fuse concealed on board by a spy. It is probable, however, that the cause was the spontaneous explosion of some of the charges in one of the magazines. The finest ship in the Italian Navy, costing over £2,000,000 to build, lay at the bottom of the sea. The blow was a bitter one to the naval authorities, and was felt to affront Italian national pride. It was determined that, by some means, the battleship should be raised to the surface again. The word went forth, and marine salvage experts from all parts of the world made their way to Taranto to gaze at the ship’s keel, which showed just above the surface of the Mediterranean. The more they looked the more impossible the task seemed. “The only thing to be done is to blow her to pieces”, said one of the famous men. And another: “It is hopeless - a sheer waste of money”. The Italians did not ail think so. The more the foreign experts dwelt upon the impossibility of the task, the more determined the Italians were to bring the battleship to the surface again. SALVAGE MEN AT WORK. A striking illustration of the men on the bottom of the upturned battleship, on January 24, 1921, making last-moment preparations for righting her. An airship is circling overhead taking photographs to record the memorable occasion. It must not be assumed that the experts did not know what they were talking about; they knew only too well. They saw a mass of metal weighing 24,000 tons lying upside down on the sea-bed. In her barbettes - hooded armoured redoubts - were thirteen 12-inch guns, which were worth their weight in gold to the Allies at that moment. The experts puzzled, without finding a solution, over the problem of dragging that mountain of metal to the surface again. Floating cranes that could lift a few hundred tons between them, or lifting craft that could raise two or three thousand tons, were equally useless, as there were were 24,000 tons to pick up and carry away in a mass. To rip the sunken ship to pieces with explosives, as was suggested, would have taken months and the cost would have been £100,000 at the lowest. All that would recompense them for their huge expenditure of time and labour and money would be a vast heap of scrap metal. The Italians could ill-afford to lose the ship. The explosives that were necessary to blow her to pieces could be far better employed in prosecuting the war; and the money would be better spent if it were used to conserve the ship instead of destroying her. Thus the Italians reasoned, and General Ferrati and his associate, Major Gianelli, attempted to solve the problem. They were not alone in their desire to raise the battleship. One of the schemes that were put forward for consideration was to build a floating dock round the ship as she lay, inserting the usual steel floor under her, a section at a time, until the dock was complete. It would then merely be necessary to pump out the flooded tanks of the dock and lift the battleship and carry her away. This seemed to be a possible solution, but there was one insuperable difficulty. It was not easy at that time to get ships, guns and shells; to obtain thousands of tons of metal for a project, the outcome of which would remain problematical until the final test, was out of the question. Quite apart from other considerations, therefore, the shortage of materials placed a veto on the plan. General Ferrati, one of the leading naval constructors, realized that any plan requiring quantities of new metal was doomed. He and Major Gianelli planned to use air to lift the battleship from the bottom of the sea as though the 24,000-tons mass of metal were a toy balloon. Compressed air had been used before as an adjunct to marine salvage work, but never had the suggestion been made to lift a battleship from the sea-bed by using compressed air alone. The two Italians, however, believed in the ultimate success of their plan. SAFELY DOCKED. A remarkable picture of the inverted battleship safely brought to dock in September, 1919, showing the giant pontoons, which helped to raise her, lashed to the hull by steel cables. Although the vessel had previously been rendered buoyant, eight pontoons, each capable of lifting a load of 350 tons, were also employed to raise her from the bottom of the Mediterranean. The ship was lifted from the sea-bed on September 17, 1919, and towed along a specially dredged channel into the dock. Having received permission, they sent down divers to survey the ship and to note the position in which she was lying and the extent of the damage that she had received. The divers’ reports were not encouraging. Extending from the keel through all the decks of the ship was a large hole, similar to a chimney, out of which the exploding magazine had burst. Even more disturbing was the fact that the ship was steadily digging her way down into the sea-bed at such a pace that she might soon be completely buried. The ship was upside down, and there were more than 20,000 tons resting on the bottom. That great weight on the sharp edges of the vessel caused her to cut deeply into the bed of mud, 30 feet thick, upon which she lay. General Ferrati and Major Gianelli believed that the vast deck would prove a sufficient support to bring the vessel to rest on the mud in a stable condition, They could not foresee, however, the cutting power of the superstructure. For six months the Leonardo da Vinci burrowed down into the sea-bed before she encountered a thick layer of clay sufficiently stiff to arrest her downward progress. The salvage men then obtained plans of the battleship and had accurate and detailed models made. Propellers, engines, guns, turrets and funnels were constructed to scale, not only in size but also in weight. The fullest particulars were obtained of what was in her when she sank - the quantity of shells, and the number of tons of coal and oil and other stores - so that the loading of the model would be similar to that of the ship. Experiments were begun with the models, intricate calculations having been made as to the weight which would have to be removed from the sunken ship, the compartments on which the divers would have to work, and other technical details. By removing the weights from the compartments of their models and by watching the behaviour of the models, they calculated how much buoyancy could be obtained by clearing the spaces in the ship, and the amount of air pressure that would be required to force the water out of the ship. While these experiments were proceeding, the two engineers were gathering the material needed to put the work in hand. Deciding to use as a platform the portion of the keel showing above the surface, they erected a living hut for the salvage men. Then they built up platforms from the submerged bottom of the ship to carry other huts that could be used as stores and other purposes. Early in 1917 the preliminaries were complete. The divers made their way through the gaps in the bottom of the ship to remove all the material that they could. The explosion had burst some of the tanks in which was stored the heavy oil, and this adhered to the glass of the divers’ helmets, almost completely obscuring their vision. They were compelled repeatedly to stop to wipe the glass, which quickly fogged up again. A GREAT FEAT PARTLY ACCOMPLISHED. The Leonardo da Vinci resting in dry dock. For two days the salvaged vessel was left floating over the timber framework while necessary adjustments were being made. At last the water in the dock was drawn off, and her weight rested on the supports. Some of the timbers had to bear a strain of 225 tons to the square inch, but the operation was carried out successfully. During the following months workmen were employed on the ship before she was righted. Although the oil was a hindrance to work, it had preserved hundreds of shells while they were lying in the sea. 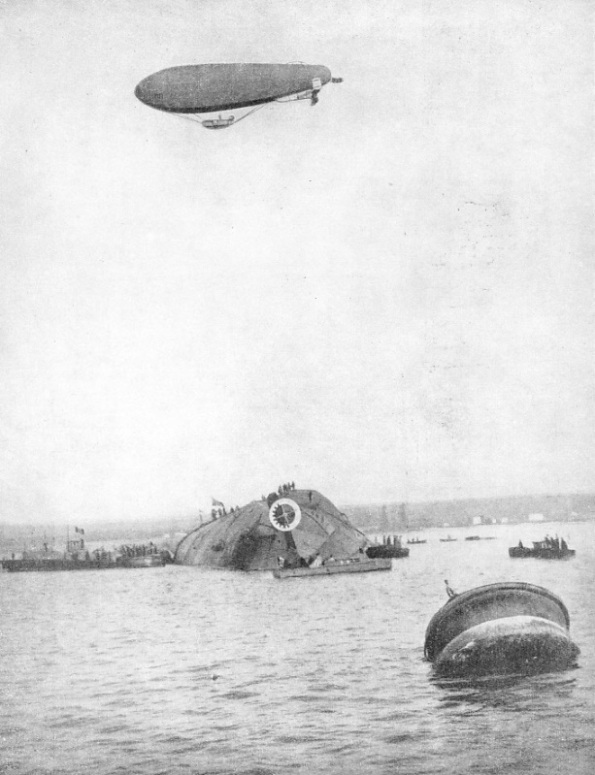 The shells were hoisted out of the ship and taken ashore. The work was carried out with such care that a thousand 12-in shells and three thousand 4·7-in shells were removed without accident. Torpedoes, charges for big guns and other munitions were recovered in safety. Rust was almost as great a hindrance to salvage operations as was oil. Much of the metal which had not been covered by oil had gone rusty. When the divers came to cut this metal they stirred up such a cloud of rust that they were unable to see and they did much of their work enveloped in a fog. Major Gianelli was always present supervising operations and conferring with General Ferrati about problems which daily had to be solved. There were large metal patches to be constructed to fit over the gashes made in the hull by the explosion, and in the patches and around the holes in the hull it was necessary to drill numerous holes through which bolts could be inserted to fasten the patches. The power for drilling had to be brought by cable from Taranto power-station, which was a mile and a half away across the sea. These were some of the many problems which were successfully attacked. The divers proceeded to drill the holes in the hull of the battleship to take the bolts for the patches. It was a long and laborious task, for the plates were thick and hard, and the risk was great. One diver lost his life while engaged on this work. When the holes had been drilled, the divers fitted round the apertures rubber packing on which to bed down the plates and make a water-tight joint. The plates were then lowered to the divers, who signalled and manipulated until the plates were in correct position. The key pins were slipped through the bolt holes to hold the patches in place while the other bolts were inserted. Besides attending to these patches, the divers sealed up all holes to a certain depth in the hull. The bottom and sides of the battleship had to be airtight, as the salvage engineers intended to pump large volumes of air into her. In the workshops ashore several round towers were made. Somewhat resembling the conning-towers of submarines, they were air-locks, so constructed that when the hatch at the top was closed they were air-tight. After they were bolted over manholes, made in the hull of the ship, it was possible for men to pass in and out through the air-locks without letting the air in the ship escape. The interior of a ship is a maze of pipes of all sizes leading from one compartment to another. Some of the pipes are big enough for a man to crawl through. All these pipes in the first compartment had to be found and sealed up to prevent the air from escaping. This task was made more lengthy by the oil, which clogged some of the pipes so completely that they were difficult to find. THE INSTANT OF SUCCESS. The battleship Leonardo da Vinci rights herself, and makes a tremendous wave while doing so. At first it appeared to the observers that the ship would turn a complete circle and end upside-down again. But after rolling from side to side the great vessel ultimately came to rest, with a list of a few degrees towards her weighted side. At last air was pumped into the bottom of the ship through the air pipes, and gradually the level of the water in the ship was reduced until men were able to work without diving suits. They worked there in the compressed air with the sea outside the skin of the ship some 26 feet above the level of the sea inside the ship. Removing coals and as much dead weight as they could take out of the ship, they worked their way through the compartments. Thick oil frequently hid apertures, the presence of which was shown by escaping air, and much time was spent in tracing and dealing with these leaks. Fifteen months after the Leonardo da Vinci had heeled over and sunk, the engineers detected a slight movement of the ship. This was the first indication that their undertaking was likely to be successful. Several difficult problems remained to be tackled, however. It was necessary to find a means of releasing the ship from the clay and silt which held her, so that she might float free. If the ship were floated upside down she could not be towed to the dry dock, since her superstructure would not clear the sea-bed. 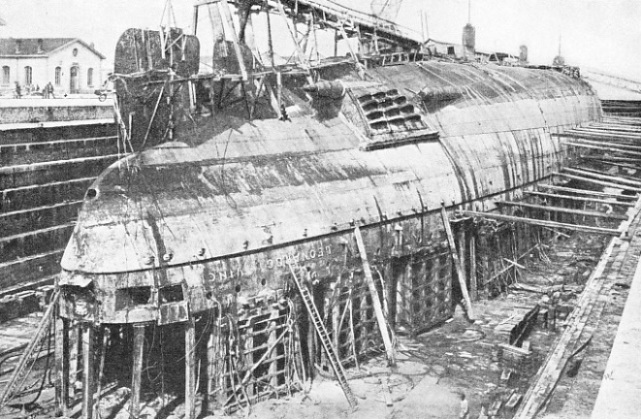 Further, the dry dock at Taranto would not take a ship drawing more than 40 feet of water, and in an inverted position the Leonardo da Vinci would draw at least 50 feet. It was decided to decrease the draught of the ship by cutting off her funnels and turrets. Critics pointed out the uselessness of attempting to wash away the clay and silt from the funnels so that they might be cut off, as the sea would rapidly wash the silt back. The divers would thus be occupied in removing the silt to the neglect of their main task. Major Gianelli realized, also, that by cutting away the mud he would be removing the material supporting the vessel and enable the ship’s weight to force her still farther into the sea bed. FUNNELS, GUN-TURRETS AND MASTS were removed from the battleship while she was still under the water and before the raising began. This was to facilitate salvage operations. When the cutting away of these structures had been finished great patches had to be laid across the gaps left. Coal and ammunition had also to be removed before the ship was raised. This picture shows the recovered ship moored at Taranto Dockyard before she was taken into dock to be refitted. The plan adopted was to cut off the funnels and turrets from inside the ship, leave them in position in the mud, and make arrangements for lifting them after the hull of the vessel had been removed. This meant pumping more compressed air into the ship and driving the level of water down until, in one of the main compartments, it was 56 feet below the surface of the sea. The salvage men were working with the mud outside the ship 20 feet above the level of their heads. Their task was a long one and the costs steadily increased. Every day 150 men climbed in and out of the air-locks to shear through the funnels, gun-turrets and masts, and an entire year was thus occupied. 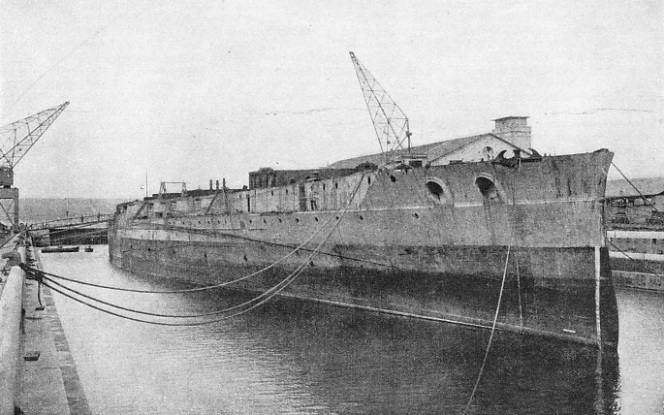 Although compressed air seemed to be giving the required buoyancy, Major Gianelli decided early in 1919 that he would call in the aid of eight camels, or pontoons, each capable of lifting a load of 350 tons. A pontoon is a hollow cylinder similar to a large boiler or tank which can be flooded or emptied. A course was buoyed from the ship to the dry dock, and dredging operations began, to make the channel deep enough. It was a considerable task, and in a week or two the dredgers removed many tons of mud and silt. Major Gianelli and the Italian naval authorities were determined to make every effort to put the Leonardo da Vinci into commission again. It meant repairing her in dry dock and attempting the unprecedented feat of righting an inverted battleship of 24,000 tons. So that the dock at Taranto could accommodate the ship in her inverted position, there had to be erected a large staging on which she could settle deck downward. Some of the baulks of timber constituting the structure were fifteen inches square. All were built up into a solid scaffolding, with towers of timber here and there to support the centre of the decks. On September 17, 1919, the first test was made. Air compressors began to force air into the hull at a great rate. Their nozzles were coupled up with the pontoons until the air had expelled all the water from them. It was a delicate operation that called for the nicest balance in the ship if success were to be achieved. It meant forcing more air in one compartment to give it a greater lift where the weight was heaviest, and leaving less air in other compartments so that the lift in them would not overbalance the wrecked ship. At last the battleship heaved and, released from the grip of the mud, rose to the surface amid foamy fountains that gushed up all round her. The salvage men then inspected the ship to see that she was fit for towing. When they were satisfied, tow ropes were fastened to her and, for the first time in modern history, tugs began to tow an inverted warship. Progress was painfully slow, as care had to be taken to keep her in the middle of the dredged channel, to prevent her from grounding, but by nightfall she was brought to within a few yards of the dock entrance. Here she was left until the morning. Then, by careful manoeuvring, they alined the mark on the keel of the battleship with the mark placed as a guide on the end of the dock, and gradually edged her into the dock a foot at a time. It was essential that the timbers on which the vessel was to rest should be in the correct position, and she was kept floating over them in the dock for two days while adjustments were being made. The water was slowly drawn off and the battleship settled gently and almost imperceptibly until her weight was resting on the timber framework. That was a critical moment. Some of the timbers had to bear the strain of 225 tons to the square inch, but they supported this strain without giving, and the ship rested as securely on the timber framework as though on solid rock. During the next few months men were swarming about the battleship making permanent repairs to her armour-plating and decks under the supervision of Major Gianelli. There were many delicate technical points to settle and calculations to work out. A shipbuilder makes the keel of a ship strong enough to support all the superstructure above it, but he does not design the deck to support the mass of the ship if it is turned upside-down. In view of the unexpected pressures that would be thrown upon the Leonardo da Vinci when being righted, Major Gianelli had the whole deck strengthened throughout to withstand the maximum pressure that was likely to be imposed upon it. In the bay a deep basin was dredged in which the ship could be turned over without touching the bottom as she swung. Meanwhile, 400 tons of solid ballast were loaded into certain portions of the ship. According to Major Gianelli’s calculations, it was only necessary to pump 7,500 tons of water into certain compartments on her starboard side to achieve the desired object. With that weight on one side, the ship would lose her balance, the weighted side of the ship would go down, and the momentum would right the vessel. 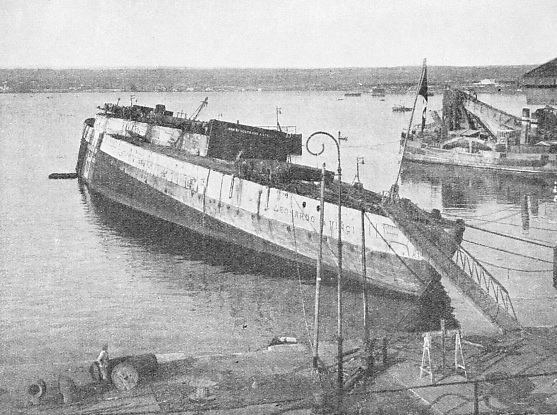 Towards the end of January, 1921, the dry dock at Taranto was filled with water and the inverted battleship was floated off the timber structure. The dock gates were opened and the tugs hitched on their tow lines and drew the vessel out into the open. An airship circled overhead. The water flowed into her compartments, and 800 tons caused her to list. She continued to list as the weight of water increased until, with a rush, she swung completely over and came to rest the right way up. At first it seemed as though she were going to complete the circle and finish upside-down. But after swinging well up on the opposite side, and moving from side to side, she finally came to rest, with a list of a few degrees, due to the water in that side of the ship. As the deck of the battleship swung up into the sunlight the onlookers saw painted across the ship the words: “Every wrong rights itself” - the motto of the great Italian after whom she was appropriately named. FLOATING ON AN EVEN KEEL. The salvage operations completed, the Leonardo do Vinci is seen ready for refitting. The salvage work cost the Italian Government £135,000, but for this sum a £2,000,000 warship was saved and rendered fit to be put into commission again. You can read more on “Dramas of Salvage”, “The Italian Navy” and “Italian Shipping” on this website. You can read more about this salvage in chapter VII of David Masters’ book “The Wonders of Salvage”.